Preschool and kindergarten has been a topic discussed in my home quite a bit recently. . . the public schools in our area are notoriously bad, and there is no way that we’ll be able to afford to send T to a private school at this time. Even though we don’t really have to worry about it quite yet, I don’t want to stake my baby’s education on the hope that our situation will change within the next few years (though I pray it does). After doing some research I’ve found that T, having just turned two, is already pretty far along in meeting the requirements for starting at a private kindergarten. I can’t imagine where she’ll be at 4 or 5 if she continues soaking everything up the way she has been. All of the afore-mentioned things have led us to the decision to home-school T – for a while, anyway. If and when our financial situation changes, we’ll re-evaluate our decision based solely on T’s academic level at that time, but I’m guessing that we’ll be doing elementary school from home at the very least. . .The prospect of this is terrifying, to be perfectly honest. To have the sole responsibility of educating my daughter left to . . . ME?! This week I decided to start “sit down and teach the kid something” school time (to quote my biggest fan), I figure that getting a head-start and adding basic learning time into our normal lives at this age will only make things easier as this goes from play to ‘real’ school. We really aren’t changing our usual routine very much. Just taking the time of day that we already use for arts and crafts, and incorporating numbers and letters into it. T already can count fairly well (Puff goes to 11 – though for reasons unknown to us, she randomly will go on strike against certain numbers at random times), and is doing pretty well at recognizing which letters are which. She also understands that letters make words. But she doesn’t know what ‘sounds’ all of the letters make (though she does know several), doesn’t understand that lower-case letters are the same as their capital counterparts, and she doesn’t know what numbers look like (except the number 2, for obvious reasons!). 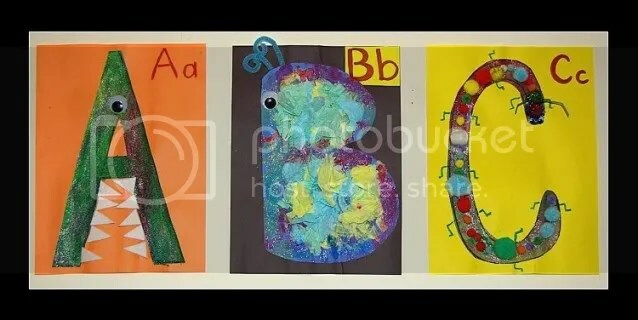 Our crafts this week have all been letter related, we’re going to make our own alphabet book – eventually. We’ve also spoken a lot about the numbers 1,2, and 3 – though we didn’t actually DO anything but draw them and identify. 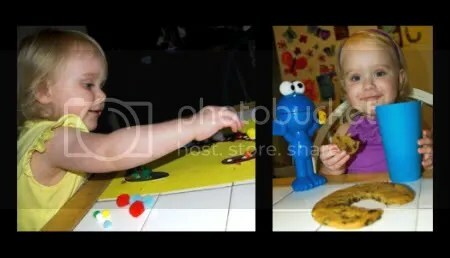 she also had loads of fun at snack time counting how many we had, eating one, and counting again – but that’s normal over here! T also enjoyed searching through books for both the capital and lowercase letters that we had been discussing during story times throughout the week. Here are a few pictures for you of T’s maiden educational endeavors. . . I was excited about the letter A, because when she saw it on the board, she not only recognized it (capital form) for what it was, but also already knew what sound it makes!’ We made an A into an Alligator, and also glued apples to an apple tree, and T managed to glue popsicle-sticks into the correct formation without any help. Although she didn’t know the sound right away, T did know that she was looking at a ‘B.’ I’m always thrilled when she gets it right! A letter ‘B’ was turned into a Beautiful Butterfly. Puff had a blast with the tissue paper. I also turned an old box into a ‘B’ box, and we ran madly about finding things that began with the ‘buh’ sound. 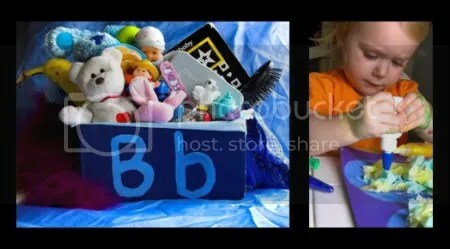 She did brilliantly, and found items for her box that even I hadn’t thought of! To T’s delight and my amusement, we got to watch my old pal Cookie Monster sing his world-famous ‘C is for Cookie‘ song (thanks YouTube, for making my life easier). . .several thousand times, and bake some of our own ‘C’ shaped cookies to gobble (though T was very naughty about trying to eat her c’s BEFORE they cooked). For our book, we turned a ‘C’ into a caterpillar. . . So far so good! She’s doing great, and we’re both having fun with it. I’m trying to keep it laid-back and silly, if she doesn’t want to do it, we won’t. Anything that I can teach her now is something I won’t have to teach her later, and a head-start means less work for both of us in the long run. . .I hope! T is VERY proud of her ‘schoolwork,’ and is quick to show visitors what she made. Her aunt was impressed when T not only told her which letter was being pointed out from her studies this week – but also if it was capital or lower-case. I’m impressed, too. I’m really happy to see that she’s picking it up as easily as anything else. Hopefully we can continue like this for a long while to come! You can feel free to ‘steal’ as many ideas as you wish – though, the question must then become from whom are you stealing? Many of my ideas have come from the good lady over at NoTimeForFlashCards.com – there is a link to her site on my sidebar. T definitley has benefited from being able to see her letters displayed as artwork on our wall. Though our end project is to be a book, I don’t see how we’ll be able to hang every letter until then. She’ll be heartbroken if I take ’em down. Glue? Elmers. ALL HAIL ELMER’S! With some stuff, paper-to-paper, or loose glitter sticking, a traditional glue-stick will work just fine. But for others – like pom-poms or the gluing of heavier things, its gotta be the juicy stuff. No worries though, if you fear catastrophe, (first of all, don’t get a dog) YOU can put the glue spots down and allow the child to apply whatever to the predesignated spot. You don’t HAVE to be kooky like me and allow the children full-access to the sticky stuff. I have hardwood floors. Its no big thang. . .
Can’t wait to see watcha come up with!